Police charged Gupta on March 16 for alleged “financial irregularities worth Rs 50 crore” and booked him under clauses of criminal conspiracy, forgery and cheating. A three-member probe panel of senior government officials, looking into financial irregularities at the Dau Kalyan Singh (DKS) government super speciality hospital in Raipur, has submitted a report alleging expenditure worth crores without official approvals, overspending, and the submission of false audit reports. 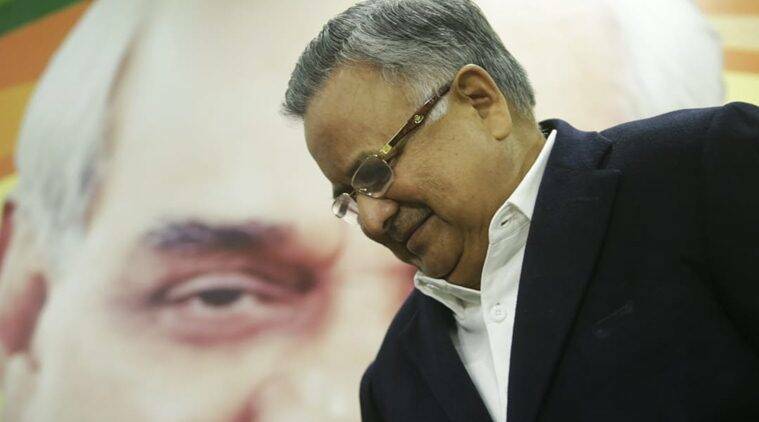 It is based on this 18-page report that Chhattisgarh Police last week registered an FIR against Dr Puneet Gupta, son-in-law of BJP leader and former three-time Chief Minister Raman Singh. Gupta served as Superintendent of DKS hospital from January 2016 to January 2019, when he was shifted out by the Congress government — he later resigned from government service. Police charged Gupta on March 16 for alleged “financial irregularities worth Rs 50 crore” and booked him under clauses of criminal conspiracy, forgery and cheating. The charges are based on a police complaint, filed by the new DKS Superintendent, Dr K K Sahare, who cited the report submitted by the committee set up by the Chhattisgarh government. Sahare’s complaint cites the probe report in detail and states that it was submitted by the committee on March 8 after conducting an inquiry and speaking to those involved in the tender process at the hospital. “… the former superintendent Dr Puneet Gupta misused his position, used his reach to commit fraud worth 50 crore of public money, forged documents and made a fake audit report, to benefit himself and some others violated government rules and appointed unqualified people, and hid financial evidence,” the complaint states. It states that the committee, which comprised Special Secretary A P Tripathi, Joint Secretary Priyanka Shukla and Additional Director Ratna Ajgale, was set up on February 15. Speaking to The Indian Express, Arif Sheikh, SSP, Raipur, said that “investigations are underway”. When contacted, Joint Secretary Shukla said, “We have submitted the report to the government, and I would not like to comment on the rest.” Dr Puneet Gupta was not available for comment despite calls and messages from The Indian Express. The panel’s report alleges that a Detailed Project Report (DPR) to secure loans from banks, which was made available by the DKS Superintendent, does not have approval from the state government. The report also cites hospital records to state that an audit was carried out by chartered accountancy firm, “PR Sancheti and Company, Devendra Nagar”, without approval from the appropriate official. It adds that the firm has denied conducting this audit. “The auditor of the DKS Hospital, PR Sancheti and Company, have informed that no such audit was carried out by their organisation. The audit reports attached in the forms for bank loans by the DKS hospital has not been prepared by them, and that report has been prepared and signed by some other person on their letterhead. Therefore the DKS institute forged audit reports to get bank loans,” the report states. Sources told The Indian Express that the loans received were to the tune of around 50 crore, but added that it would be confirmed once investigators receive official intimation from the banks concerned. “We have taken the statements of the enquiry committee, and have spoken to the chartered accountancy firm. We have communicated with banks too and are awaiting official communication from them,” said SSP Sheikh. The report states that in several departments, the tenders given far exceeded the estimated budget. For security services, for instance, the report states that the estimated tender budget was Rs 6.66 crore, while the appointed agency has been given a tender of Rs 21.19 crore. The report states that the state department of finance had flagged these issues, including that the issue of the tender had not been given approval. On the subject of “laundry services”, the estimated tender amount was Rs 5 crore, while the tendered company has to be paid Rs 17.28 crore. “Without a comparison by the company that was L1 (lowest bidder), or even a comparison with market rates, work was sanctioned at excessive rates,” the report states. It also states that employees were transferred to the DKS hospital from other posts, and were given salaries beyond their pay grade, which is a violation of government rules. * Approval for “dietary and other related services” was based on conditions that the company would have a net worth of Rs 2 crore and an annual turnover of 6 crore. But the tender was issued to a company with a net worth of Rs 1.6 crore and a turnover of Rs 5 crore. “The then Superintendent issues letters of intent to the connected companies without approvals from the appropriate officer,” the report states. * Questioning of members of the tender committee in the hospital showed that the terms of tenders, or changes to them, were allegedly made by the superintendent himself. The committee claimed that there were no approvals for security service tenders, and that they were not aware of those issued for pharmacy services. * Rs 126.819 crore was spent on equipment without “any approval from the state government”. “According to the DPR prepared for loans, the provision made for medical equipment was 59.97 crore rupees, but the actual purchase was 126.819 crore.When questions were asked to the committee set up for equipment purchase, they made it known that only information on requirements and medical specifications was taken from them, and the other conditions were decided by the then Superintendent Dr Puneet Gupta,” the report states.